Missed on the 1st attempt at 460lbs. Weird. Probably leaned forward too much. Missed on 2nd rep at 460lbs. Getting the hang of the reverse grip bench press. Less pain in my forearms at >300lbs compared to a regular bench press. I like it! Not bad. Challenging, but the bar seemed to move up quickly. Still feels challenging-but-not-too-bad. Add another 10lbs. I think this is a paused bench press PR. About 6 1/4" off the ground. 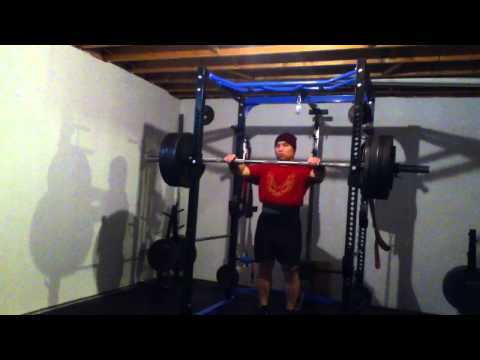 (at the #3 hole in my power rack and standing on a 3/4" piece of wood).